Zibo Zhao, PhD, a postdoctoral fellow in the laboratory of Ali Shilatifard, PhD, has received a 2018 Young Investigator Grant from Alex’s Lemonade Stand Foundation (ALSF) to further her research focused on developing new therapies for children with leukemia. Dr. Shilatifard is the chair of Biochemistry and Molecular Genetics, Robert Francis Furchgott Professor, director of the Simpson Querrey Center for Epigenetics and a member of the Lurie Cancer Center. 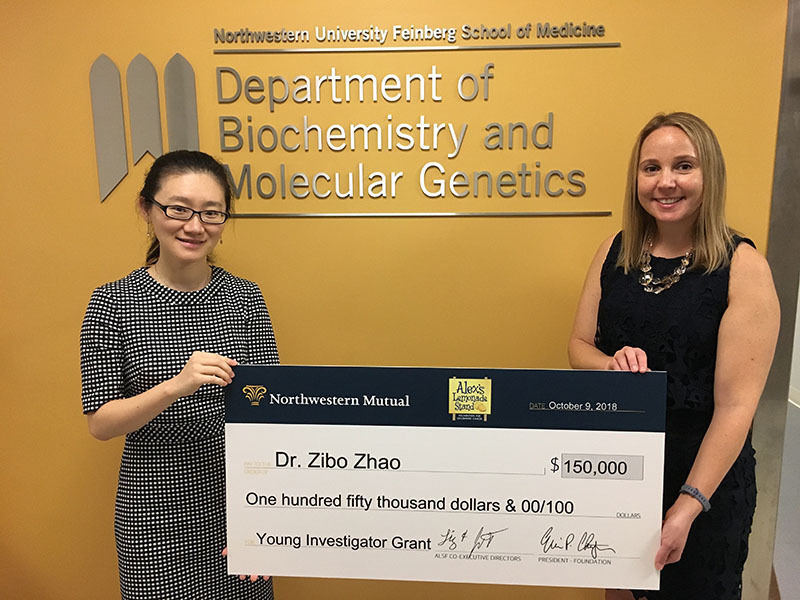 Co-funded by Northwestern Mutual, the grant will provide $150,000 to support Zhao’s project, “Therapeutic Targeting of Childhood Leukemia by Pharmacological Inhibition of Proteolytic Cleavage of MLL1.” Zhao is one of only 16 early career scientists to receive a 2018 Young Investigator Grant, designed to help young researchers at 10 top institutions across the country find more effective treatments leading toward cures and improved quality of life for children with cancer.